EarringsAlure #sparknaturals I want to tell you about 2 different products I received this week. 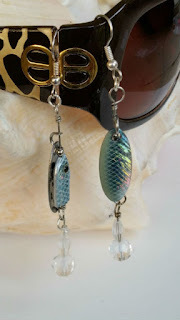 The first is a pair of earrings from Earrings Alure. They are so cute! !They are 3 3/4 inches long and made to look like a spinner bait fishing lure. The ear wires are silver plated surgical steel. The company has many really cute pieces of jewelry to choose from and are well priced. These are hand made. Next I'd like to tell you about Spark Natural Peppermint Essential Oil. As always when I receive a product like this I research to find the uses for it. 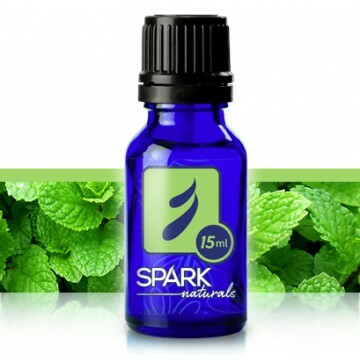 Peppermint Essential Oil can be used both topically and taken internally. Topically it can be applied to the skin for a cooling calming affect and can relieve sore muscles. It can also be applied to the wrist or tummy to relieve general nausea. You can put a couple drops in water to relieve a stomach ache or nausea. A drop or 2 will relieve bad breath too. It can be inhaled to relieve motion sickness. This is an essential oil to keep on hand.